That’s true, of course. But the foodservice industry racks up billions of dollars in annual litigation spending due to consumer and employee injuries and illnesses. It’s obvious that more than simple human error is at work. Many of these unfortunate happenings could be prevented by following industry standards and taking reasonable precautions. 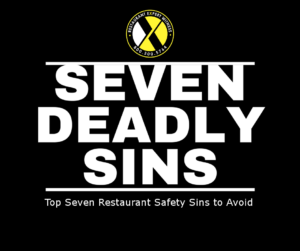 So, a more appropriate quote is, “An ounce of prevention is worth a pound of cure.” Listed below are Seven Deadly Safety Sins restaurant owners and managers should always avoid! 1. Avarice: Restaurant owners and managers shouldn’t skimp on safety costs! Proper equipment, adequate employee pay, and safety training materials can be expensive – but not as expensive as the lawsuit that could arise if you don’t attend to these costs as a preventative measure. 2. Procrastination: All too often, “accidents” happen because management hasn’t instated standard operating procedures that give employees tools to prevent them. Proactive safety policies and procedures are the best way to avoid unsafe conditions. These safety-conscious standard operating policies should be developed and put into writing before unsafe conditions arise. 3. Sloth: A restaurant manager should not spend his or her entire shift in an office, watching employees through the security cameras. It’s important for management to be out on the floor, leading by example and actively encouraging employees to conform to industry regulations. 4. Filth: Do you know the proper pH for your restaurant’s sanitizing solution? Or the proper solution-to-water ratio for your mop water? The smallest mistakes can turn restaurants into bacterial breeding grounds! It is important for management to exercise stringent oversight to keep restaurants sanitary and safe! 5. Contamination: Cross-contamination happens when an allergen is unintentionally included in a food item through contact during preparation or storage. According to the CDC, the number of people affected by food allergies on the rise – so restaurant owners and managers can’t afford to be conscientious about allergens! 6. Apathy: If a restaurant manager isn’t motivated to assure safety standards are met, the employees working under her or his supervision won’t be, either. 7. Ignorance: It’s a restaurateur’s duty to stay apprised of industry standards and best practices – and to keep employees apprised of those standards and best practices. Management should provide ongoing training and education to all employees. To learn more about restaurant industry standards and best practices, check out Howard’s newest book, Restaurant OSHA Safety and Security. To find out more about Howard Cannon’s book or to purchase a copy, CLICK HERE. To find out more about Restaurant Expert Witness and Mr. Cannon’s services, CLICK HERE.